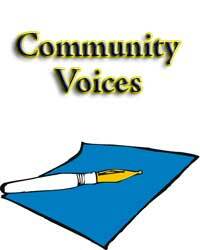 Editor’s Note: Today, we continue a semi-regular feature, Community Voices, featuring writing by members of the Unionville community on a wide range of topics. Many of the writers — including the first three we feature this week — are students and we think they have interesting insights. We thank these gifted young writers for their contributions and will continue to publish more in the future. Let us know what you think and thank you for all of the positive feedback on our previous installments. In life, self-image is important, to a certain extent. Self-image and what people think is not a priority. Doing the best in life is key. When thinking of self-image, most people think of appearance. Self-image is also what we, personally, think of ourselves on the inside and out. Self-image can only be decided by oneself, hence, self-image. Our own opinions make up our self-image. In middle school, everyone is working on self-image. From trying to be popular, or being a star athlete, and in 10 years is all of that really going to matter? People are going to remember us for the kind of person we are, not our social status. What’s going to matter to them is, “I remember her. She picked up my books when I dropped them,” not “she sat at the cool table at lunch with all the popular people.” What others think of us shouldn’t matter. Be true to yourself, because in the end, that is all that is going to matter. Actress Judy Garland once said, “ Always be a first-rate image of yourself, instead of a second-rate version of someone else.” She is saying that you are a first-rate image of yourself, but if you try to be like someone else, you are only going to be a second-rate version. Middle school is all about finding yourself. Lately, I have been finding that people care too much about what others think. Everyone has a unique style. School is a place to learn and get an education, not to worry about what everyone around you are going to say or think if you do something. We need to live in the moment, not the past or the future, just the here and the now. If we’re worrying about our self-image, that’s time not spent learning. It takes away from people being themselves. Self-image should be made up of who we truly are and what we believe in, not what we want to pretend or want people to think we are, just who we are. Over the years, I developed my style, and created my image, by being myself. I dress the way I want to dress, and I act the way I want to act regardless of how silly other people may think I am. I created my image by being myself, not by doing anything based on the beliefs or bias of others. I am the way I am. With my friends as well, there are no two sides of me and there never will be.